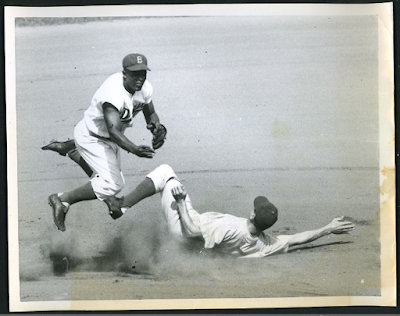 Both feet in the air, Brooklyn second baseman Jackie Robinson whips the ball to Gil Hodges at first after forcing Chicago Cubs' Hank Sauer out at second in the second inning of the Ebbets Field Contest, Sept. 11. 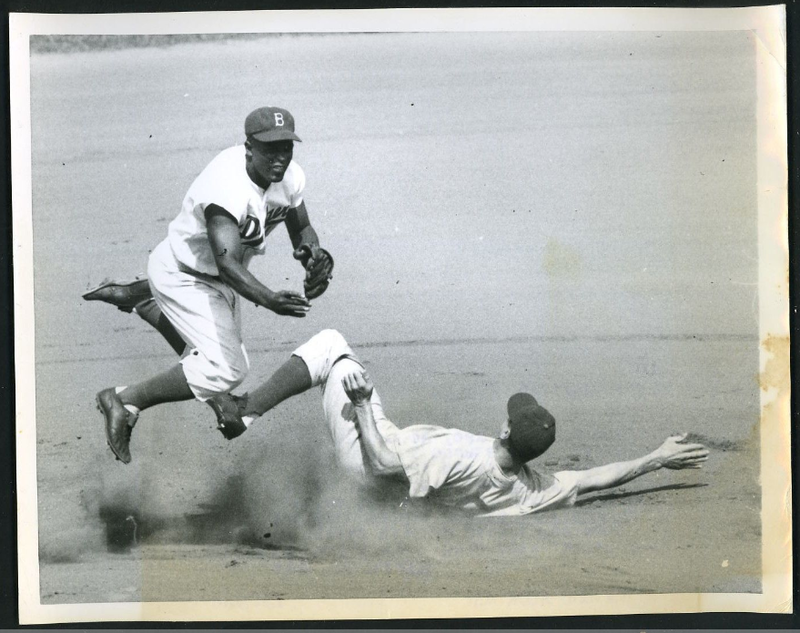 Jackie was too late for the double play. Sauer tried to advance to second on Toby Atwell's grounder. This Day in Dodgers History: In 1962 left-handed rookie Pete Richert made his major league debut by striking out the first six batters he faced -- tying records for strike outs in an inning (4 K's in the 3rd inning), successive strike outs by a pitcher in his major league debut, and consecutive strikeouts by a relief pitcher. "I had good stuff and somebody up there likes me," Richert said of his first big league game. "What I mean is that I always say a little prayer when Im nervous and excited. And I was tonight as I started walking to the mound." Happy Birthday, John Harkins, Mickey O'Neil, Walt Moryn, Vicente Romo, Paul LoDuca, Antonio Osuna & Justin Ruggiano! You can check out a bunch of great photos from Jon SooHoo from Mondays game here. Per Richard Justice at MLB.com; "New statue depicts Jackie as player, man: MLB pioneer will be honored at Dodger Stadium on Saturday." The other part of his life will be told on the base of the 700-pound bronze sculpture on which a sampling of his words will be embedded. "I'm not concerned with your liking or disliking me… All I ask is that you respect me as a human being." Chris T at When Topps Had Balls shares a fantasy Baseball card of former Dodger Henry Cruz. Mike Ozanian at Forbes shares this season; "Baseball Team Values 2017. "The Dodgers are valued at $2.75 billion. Jim Callis at MLB.com has the official; "2017 Draft bonus pools, pick values." The Dodgers will have $5,794,200 available to spend in bonus pool money. Per Nicholas Paschal at Yahoo TV; "Jenna Elfman Apologizes for Being ‘Annoying’ at the Dodgers Game." Via Harold Uhlman at Think Blue LA; "Loons’ Carlos Rincon on fire in Midwest League." 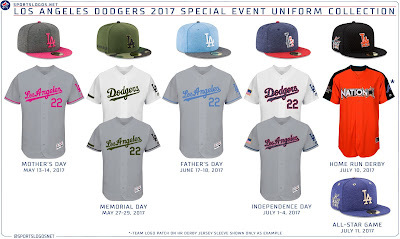 MLB unveiled the various 2017 holiday Baseball uniforms for each team. Check out Chris Creamer's report on them at Sports Logos.net. 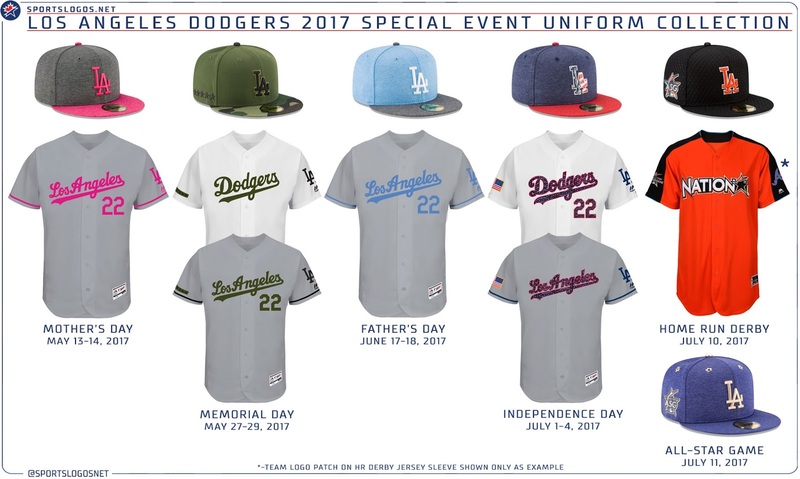 Below are the Dodger uniforms. Furthermore, players will wear specially designed socks, as well.